Additional information is available at www.TexasRallyforLife.org. The annual Texas Rally for Life commemorates the tragic January 22, 1973 Roe v. Wade Supreme Court decision that legalized abortion through all nine months of pregnancy. This decision has resulted in the deaths of more than 50 million innocent unborn children and harm to countless women in America. There are more than 81,000 abortions per year in Texas, according to the Texas Department of State Health Services. The event will also promote the Sonogram Bill in the Texas Legislature (Senate Bill 16 and House Bill 201) to give a woman considering abortion the right to see the image of her unborn child and to hear the heartbeat. The bill also addresses loopholes in the current state law used by abortion providers to prevent women from receiving state-created materials about the risks of abortion to the women, the characteristics of the unborn child, and compassionate alternatives to abortion. More than 20 pro-life organizations from across the state form a Host Committee to put on the Texas Rally for Life. Many of them provide direct assistance to mothers experiencing unplanned or crisis pregnancies. 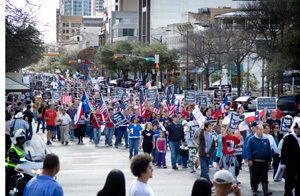 "The Texas Rally for Life sends the message that Texas is pro-life," says Joe Pojman, Ph.D., executive director of Texas Alliance for Life, one of the organizations on the Host Committee. "We support overturning Roe v. Wade. Until that day comes, we support pro-life state laws like the Sonogram Bill. Women considering abortion deserve the right to fully informed consent, including a sonogram."